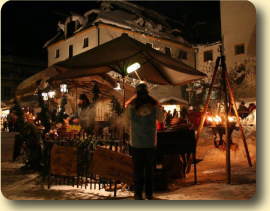 The Ettal Christmas Market, near Oberammergau, is located in a narrow mountain valley at the Western Alpine foothills of Bavaria, almost 900 meters above sea level. The large, castle like grounds of the monastery is the ideal setting for a perfect and truly romantic Christmas Market. 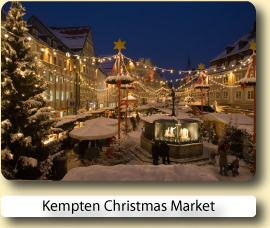 If you are looking for a Christmas Market which has a good chance of snow then this is the one to aim for. 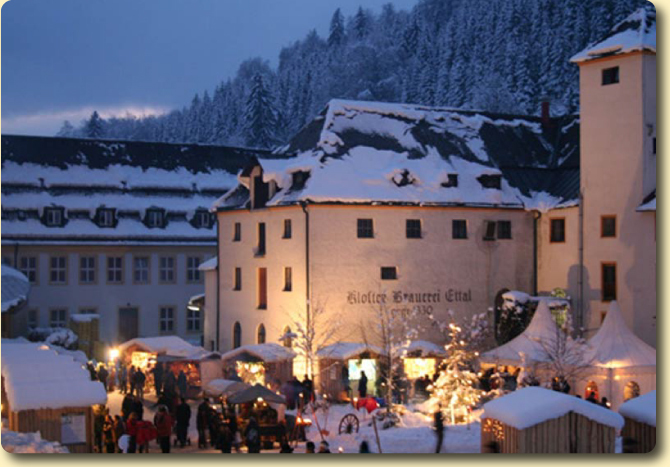 The Ettal Christmas Market is dominated by a magnificent abbey, surrounded by distinctive baroque buildings, rich green pine trees and snow covered mountains. For children there are pony rides, horse drawn sledges and craft tinkering clubs. 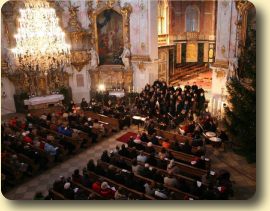 If you are young at heart you will enjoy the numerous Bavarian brass band concerts or classical organ concerts which are held within the abbey. Other activities nearby include snow shoe walking, cross country skiing and a Bavarian style of curling. To keep warm, atmospheric bonfires, carved in tree stumps are lit. Further warmth is provided by lots of wooden and festively decorated stalls selling hot mulled wine. In case all else fails, to keep warm, then there is always the monastery’s greenhouse, where under tropical conditions orchids are grown and sold. Being almost self-sufficient the monastery produces most of its own food and most importantly some excellent beer. Before you go make sure you buy some freshly baked bread, it is the best ever! 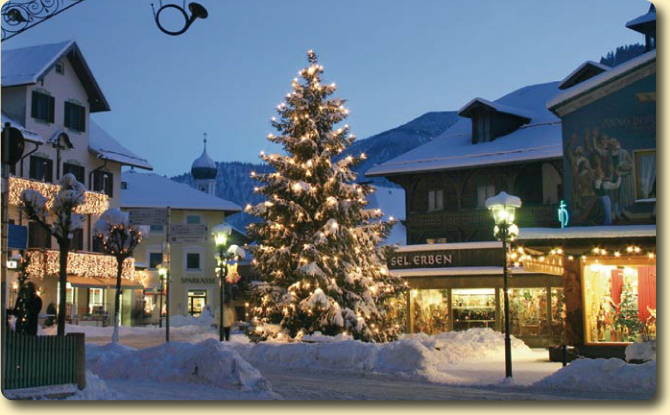 The opening of the Christmas market season starts in Oberammergau on the third and fourth advent weekend every year. 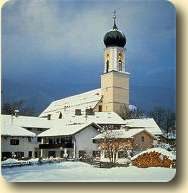 In Oberammergau you can find everything you might be looking for during the Christmas season, from homemade jams, hand-knitted socks, to skillfully crafted Christmas jewelery - all in the middle of a traditional Bavarian snow-covered village, surrounded by mountains and fresco painted houses. Of course, you can also discover the world-famous wood carvings: one example is the hand carved Holy Family, so small that it fits in a nutshell! 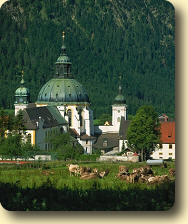 This beautiful village, with the Ettal Monastry nearby, is surrounded by mountains. Set amidst the Bavarian Alps, it is full of tradition and has only 5000 inhabitants. Almost every house here is lovingly painted and a splendid piece of art. 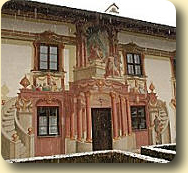 Using an age old method all paintings are painstakingly created by hand with traditional Bavarian motifs and décor. Of course Oberammergau is primarily known throughout the world for its Passion Play, which takes place every ten years. The next play is due between mid-may to October 2020. The first ever Passion Play dates back to 1634 and has since been played 40 times. What makes this event so unique is that only residents who were born or have lived in Oberammergau for at least 20 years and local children are allowed to participate. During the six months the Pasion Play is held, more than one third of villagers volunteer to take part for little more than a small amount of pocket money. Any profit made by the Passion Play is re-invested straight into local facilities helping to make Oberammergau a great place to live and a fantastic first class holiday resort. The main industry in Oberammergau is wood carving, mostly hand made sculptures, often depicting local and religious history. Anyone who is game for a challenge might even be tempted by taking part in a wood carving course. Definitely worth visiting is the local woodcarving museum which shows a truly amazing nativity scene, with the weeding feast at Kanaan next to it. Centrally located, Oberammergau is a perfect base for easy excursions to Munich, the fairytale castles in Füssen, Linderhof Castle, the monastery of Ettal, Murnau on Lake Staffel and Germany’s highest mountain the Zugspitze. Activities are not in short supply either in Oberammergau, boasting a state of the art fun pool, miles of mountain trails and excellent winter sport facilities, including Europe’s toughest and steepest ski slope. Facilities and activities are available for all levels of fitness from families enjoying a leisurely stroll along the river Ammer or to the British Royal Air Force who regularly train here during the winter months. A centrally located small hotel with everything you need and good service too. Breakfast was fresh and adequate. The hotel was quaint, welll located with wonderfully helpful staff and a great breakfast buffet with made to order omlets, eggs, bacon and sausage. I give this hotel 4 stars because of it's location, on the grounds of the Schloss Linderhof. It was possible to wander the grounds of the castle before it was open. Great hotel, good spa. I would definitely go back. Breakfast and restaurant in the hotel were excellent. 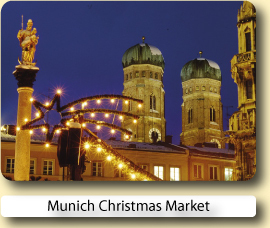 Book your hotel for the Ettal Christmas Market with Expedia or Hotels.com.Both online reservation services will let you compare and book hotels at great low prices.